Citation Information: J Clin Invest. 2017;127(11):3937-3953. https://doi.org/10.1172/JCI92387. Intrathecally administered NPCs ameliorate chronic EAE. (A) Top: Clinical scores of EAE mice treated at the peak of the disease (4 days after the clinical onset, arrow) with intrathecal injection (into cisterna magna) of either NPCs (red dots) or PBS (black dots), n = 20 mice per group. Each point represents the mean ± SEM; 70 to 82 dpi, 2-way ANOVA with Bonferroni’s post-test, *P ≤ 0.05. Bottom: Linear regression curves of clinical score from the day of treatment with either NPCs or PBS until 60 or 80 dpi. Dashed lines indicate 95% CI. **P ≤ 0.01; ***P ≤ 0.001. (B–D) Quantification and representative images of spinal cord demyelination (Luxol fast blue staining) (B) and axonal loss quantified on Bielschowsky silver staining (C; at bottom right, high-magnification insets, ×100) and immunohistochemistry for neurofilaments (NF) (D) at 80 dpi in PBS-treated (black bars) versus NPC-treated (white bars) EAE mice (n = 15 sections per mouse, 3–6 mice per group). 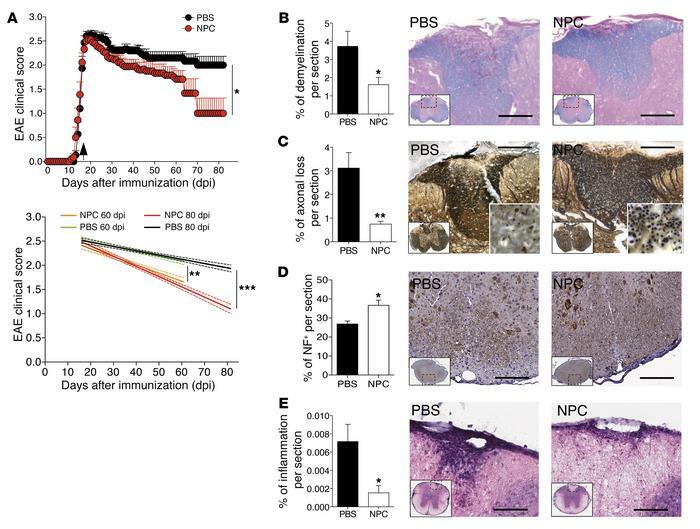 (E) Quantification and representative images of inflammatory infiltrates (H&E staining) at 30 dpi in PBS-treated (black bars) versus NPC-treated (white bars) EAE mice (n = 12–20 sections per mouse, 3 mice per group). Data are mean ± SEM and represent the percentage area of damage over total section area. *P ≤ 0.05, **P ≤ 0.01, unpaired t test. Scale bars: B–E, 100 μm.